Monarch Media: eLearning has come a long way since its humble beginnings in distance education via snail-mail, to its current state. Where do you think it’s headed? Greg Flesher: We’ve reached an exciting place. Just consider that the smart phones of today that we carry in our pockets are more powerful than the desktop computers of just a few years ago. Technology has made learning ubiquitous and literally at your fingertips. Every day you are presented with new information, data, and ideas to process and think critically about. That’s the really interesting aspect of learning. We each have our own unique personalized way of consuming content and the next wave of eLearning is already adjusting to that need for personalization. Tell us a little about your work during your term at Elsevier? I was at Elsevier for nearly 19 years although through mergers and acquisitions it was really three separate companies, Mosby, Harcourt, and Elsevier. I started as a Project Coordinator in the Multimedia department working on CD and early web- based products. Later, I researched emerging technology at a time when handheld devices (remember the Palm Pilot?) and learning management systems were starting to take shape. Blackboard was a new company back then. That background led me to start a new E-Education department for Elsevier that became very successful. Ultimately, I progressed through several senior management roles in the business and technology segments of the company. You led the establishment of Elsevier’s first online learning platform, Evolve®, which has served more than 5 million health science students and faculty worldwide since inception. Health Science as a subject requires a great deal of hands-on and face-to-face education. How did you address that in the eLearning context? Most early online courses were more of a hybrid where the faculty member would lecture in a face-to-face setting and then assign homework or specific eLearning content to complete outside of the classroom. Over time, some of the online tools and faculty teaching methods changed to take better advantage of the face time. Online tools such as discussion boards and chat also offered advantages for some learners who found it more comfortable to respond in an online setting rather than face-to-face. It become apparent that eLearning offered multiple ways to appeal to students with different styles of learning. In Health Sciences, there was often a clinical component that did require hands-on training in a lab. However, technology emerged, particularly in the area of simulation that replicated real-world situations to enable practice without requiring a trip to the physical lab. What is the biggest hurdle in building eLearning solutions and how do you overcome it? I think in any market with eLearning, an immediate challenge is that it’s different and requires a lot of planning and thoughtful attention from those preparing the material. 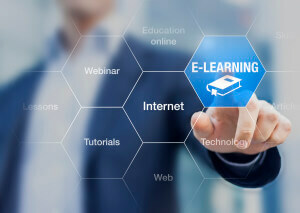 Some think that eLearning makes teaching or training easy and automated. However, that’s not necessarily the case. Easy doesn’t come from technology. A great teacher is great because they make the effort to be innovative in the classroom, they prepare, and they care. That’s the same whether they are delivering a lecture face-to-face, online, or both. Certainly, online learning management systems can automate some functions (such as grading tests) but fundamentally, it takes time and effort to deliver a great online experience. Much of that effort comes up-front by leveraging expert instructional designers appropriately to prepare content that engages learners of all styles. Lack of time and expertise present a challenge for faculty, administrators, and trainers. Monarch Media excels at reducing that burden cost effectively through specialized expertise in the development of digital content, turnkey technical solutions, and customized curriculum. We also provide an active support system for answering questions and facilitating innovation. You referred to simulations, tell us how does it make learning more effective? People learn in a variety of ways. Fundamentally, you have to experience something before real learning takes place. Simulation provides a way to accomplish that. If you work through the steps necessary to complete a particular task (such as taking a blood pressure) you can learn in a non-threatening way. You can make mistakes with drug administration and learn from those mistakes without actually negatively impacting a real patient. That’s powerful and empowering. In your new role at Monarch Media, what are you most excited about, and what changes are you planning for the company? After years in a large organization, it’s refreshing to go back to a nimble, innovative, and small company that connects with clients every single day. In a big company it’s harder to get the necessary contact with the customer. With the pace of technological change, it’s critical to engage with your customers regularly. Monarch has always done an outstanding job of that and I’m looking forward to being a part of that culture. As for changes, we’ll see. There are so many opportunities to consider, we want to be open-minded yet focused on developing relationships well aligned to our mission of delivering cost-effective open source solutions that champion learning and collaboration without boundaries. What are the key things you plan to do in your first few months here at Monarch Media? For me it’s important to form a bond with the team, absorb the culture, and learn about existing processes and projects. It’s also critical to listen. I’m excited to meet our customers through phone calls and face-to-face discussions. At the same time, I will be reaching out to my existing network of colleagues around the world to promote Monarch Media and strategize about new opportunities. The days are already exciting and flying by!